We moved into the robotic era on 21 January 2011. 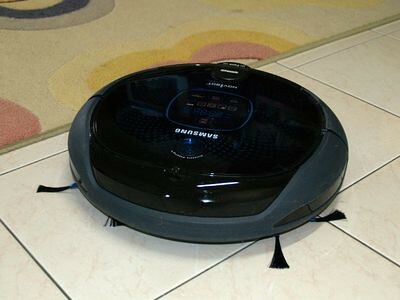 We bought ourselves a Samsung Navibot which came with a free Samsung microwave oven. Price: RM2,399. We waited to put up this post so we could really run the bot before giving our review. Julian calls the Navibot "robot Noo-Noo" (Noo-noo is the vacuum cleaner from the TV show Teletubbies). However, he is not so fond of the robot Noo-Noo, preferring it switched off :-). The microwave is a real bonus :-) A really fun cooking toy for us to experiment :-) :-). We are the crazy couple of Mutiara Place in Island Glades, Penang. We love to hide in our apartment with our kids, but we come out occasionally to forage for food. The Rabbit Hops In... With a Limp!